The contact-center infrastructure market is in transition. 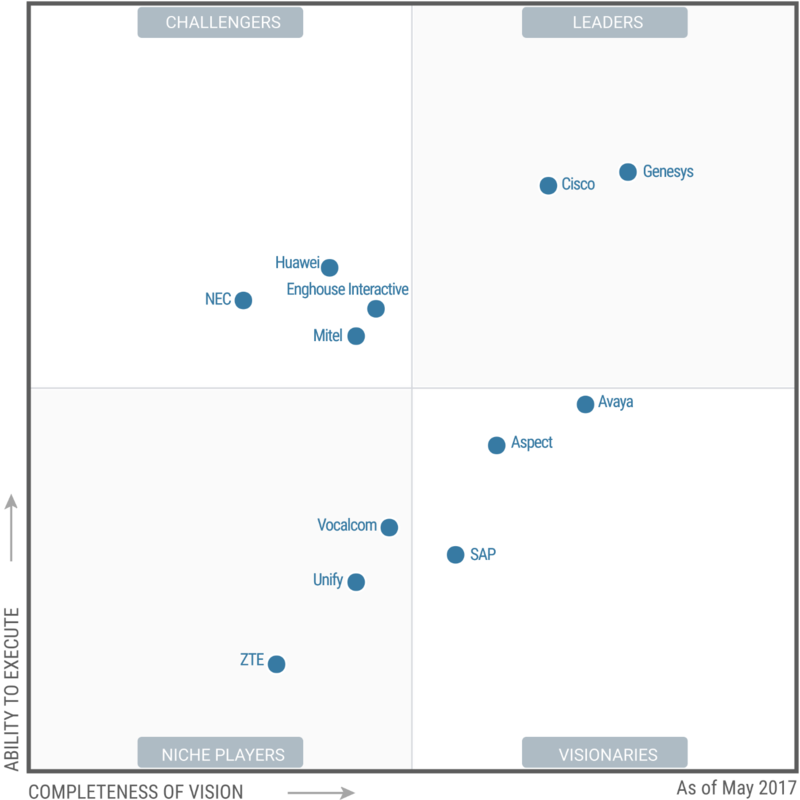 Customers are now looking for cloud-based products, integrations with customer relationship management and workforce optimization platforms, and contact-center flexibility in their unified communications deployments, according to a recent Gartner Magic Quadrant report. At its core, the contact-center infrastructure market includes products — such as equipment and software — needed to operate call centers for telephony and multichannel support. But certain trends are changing how organizations purchase and deploy contact-center infrastructure products. For example, contact-center infrastructure can be deployed as part of a customer-engagement center, such as customer relationship management and social media channels, to give organizations a single view of the customer. The technology between contact-center infrastructure and customer-engagement centers has significant overlap, but little overlap among vendors. However, Gartner expects the two markets to merge over the next few years. 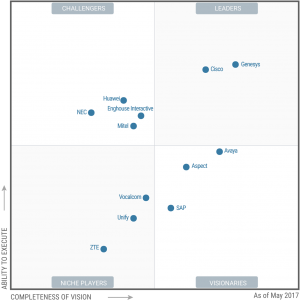 Gartner Magic Quadrant for contact-center infrastructure. Contact center as a service (CCaS) is certainly another trend that has affected the market as organizations look to replace their contact-center infrastructure with cloud-based products. Certain factors are driving organizations to the cloud, including the potential to cut costs and scale licenses to meet seasonal staffing needs, according to the report. CCaS also affected the vendor rankings in the report, which rates the on-premises contact-center infrastructure market. A vendor that shifted too far from on-premises contact-center infrastructure in favor of CCaS could see a lower score for the completeness-of-vision criteria, according to Gartner. All the vendors in the report offer some form of CCaS. These market shifts have affected the rank of several vendors in the report, and six vendors have been excluded. ALE, Altitude, Collab and ShoreTel were dropped from this year’s report since the companies did not meet Gartner’s criteria for premises-based contact-center product and service revenue. Interactive Intelligence and Presence Technology were excluded since they were acquired by other vendors. Genesys and Cisco were named market leaders in the report. Enghouse Interactive, Huawei, Mitel and NEC were named challengers. Avaya, Aspect and SAP were named visionaries. Vocalcom, Unify and ZTE were named niche players.